2009 (1) March (1) Welcome to our blog 2010 (5) June (1) IVTT Director joins G20 discussion July (1) Phil Kerr launches global Enterprise Catalyst project November (3) Are the Apprentices entrepreneurs or employees? What impact will Global Entrepreneurship Week have on Enterprise education? Teachers thinking of setting up their own businesses? 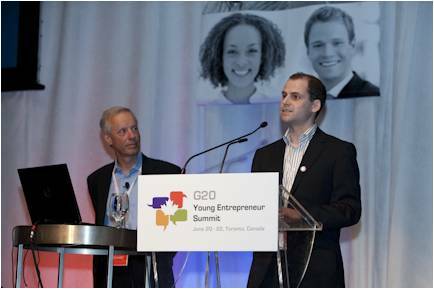 At this years G20 Young Entrepreneur Summit Phil Kerr launched a challenge for all participants at the G20 conference. To complete the Enterprise Catalyst and commence a process of understanding how global attitudes to enterprise and entrepreneurship differ across the globe. To join in go to Enterprise Catalyst and when asked for a code type G20.